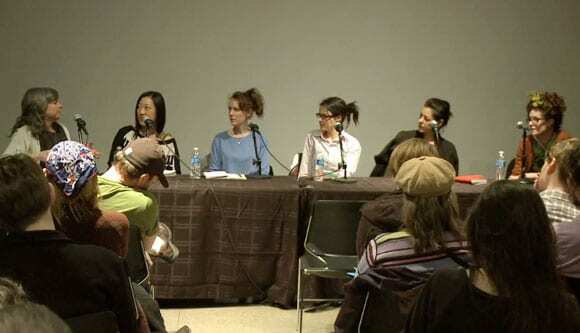 The panel discussion in this video took place at the Brooklyn Museum’s Elizabeth A. Sackler Center for Feminist Art on March 11, 2012. I put the public presentation together after receiving numerous e-mails from young female theater-makers who wanted advice on how to get their work produced. I had recently made a show called Untitled Feminist Show, and I was thinking a lot about the problem of women being so underrepresented in the theater world, and wondering what I could do about it. It occurred to me that I could get together a group of cutting-edge female theater artists who were successfully getting their work out, and record ourselves talking about how we managed to produce our own work as well as get it produced by others. Moderated by playwright Erin Courtney, the panel included Kelly Copper of Nature Theater of Oklahoma, the playwright Sibyl Kempson, Annie-B Parson of Big Dance Theater, Tina Satter of Half Straddle, and myself. The panel was recorded courtesy of Brooklyn College, where five out of the six panelists attended Mac Wellman’s playwriting MFA program. Erin Courtney (moderator) is a playwright whose work has been developed or produced by 13P, Clubbed Thumb, the Public Theater, the Flea Theater, the Vineyard Theatre, Playwrights Horizons, and Soho Rep. Her 13P show, A Map of Virtue was a critic’s pick in the New York Times and Time Out New York. She is currently writing a play called Service Road, a commission for the Adhesive Theater Project. She has collaborated with Elizabeth Swados on Kaspar Hauser: A Foundling’s Opera, which was produced at the Flea Theater and named a Downtown Theater Favorite of 2009 by Tom Murrin of Paper magazine. She earned her MFA in playwriting with Mac Wellman at Brooklyn College, where she now teaches playwriting. Playwright and director Kelly Copper is a founding member of Nature Theater of Oklahoma. With her partner Pavol Liska and the company she has created an array of original works that have toured extensively both nationally and internationally. In 2008 Kelly and Liska were awarded the Young Directors Prize at the Salzburg Festival for their show Romeo and Juliet. They received an Obie Award for their show No Dice. In 2010 the company’s current work, Life and Times—Episode 1, was selected for the Berlin Theatertreffen as one of ten outstanding works of the year in German theater. Copper holds an MFA in playwrighting from Brooklyn College. Sibyl Kempson lives and makes theater plays in NYC and the Pocono Mountains. She is a resident playwright at New Dramatists, a MacDowell Colony Fellow, and a graduate of the Brooklyn College MFA program taught by Mac Wellman. Current projects include a collaboration with Elevator Repair Service entitled Fondly, Collette Richland, to premiere at New York Theater Workshop in 2014; a Full Stage USA/New Dramatists commission for a new work in collaboration with several Austin, Texas, groups, entitled River of Gruel, Pile of Pigs: The Requisite Gestures of Narrow Approach, to premiere at the Fusebox Festival in Austin in 2014; a commission for a new play by New York City Players at the Abrons Arts Center in 2014; and a production of her play Ich, KürbisGeist by Big Dance Theater, at the Chocolate Factory in October 2012. Young Jean Lee is an Obie award–winning playwright and director who has been called “the most adventurous downtown playwright of her generation” by the New York Times and “one of the best experimental playwrights in America” by Time Out New York. She has toured her work to over thirty cities around the world with Young Jean Lee’s Theater Company. She is currently under commission from Plan B/Paramount Pictures, Lincoln Center Theater, Playwrights Horizons, and the Oregon Shakespeare Festival. She was awarded a 2010 Prize in Literature from the American Academy of Arts and Letters, a 2011 Guggenheim fellowship, and a 2012 Doris Duke Artist Award. She is a member of New Dramatists and 13P and has an MFA from Mac Wellman’s playwriting program at Brooklyn College. Annie-B Parson founded Big Dance Theater in 1991 with Paul Lazar and Molly Hickok, and has created over fifteen works that have toured nationally and internationally. Their most recent commissions have been from the Walker Art Center and the National Theater in Paris. She has received an Obie (2000), a Guggenheim Fellowship (2007), and Bessie Awards (2002 and 2010), as well as the first-ever Creativity Award from Jacob’s Pillow Dance Festival. The company will create its second work for BAM in 2014. Next up for Big Dance: Ich, Kurbisgeist by Sibyl Kempson at the Chocolate Factory in 2012. Parsons is currently choreographing Here Lies Love, written by David Byrne. Since 1993 she has been an instructor of choreography at New York University’s Experimental Theatre Wing. Tina Satter was recently described as an “emerging experimental star” by the New York Times and named a “2011 Off-Off Broadway Innovator to Watch” by Time Out New York. She has been making work with her company Half Straddle since 2008. Her plays, which she directs, have been curated into seasons in New York City and Brooklyn at spaces such as Prelude 11, Incubator Arts Project, the Bushwick Starr, HERE Arts Center, and the 2010 Ice Factory Festival. Her play In The Pony Palace/Football was named a top-ten Show of 2011 by Paper magazine, among other honors, and Family was named a top-ten show of 2009 by Time Out New York. Work in development includes a piece currently called Seagull (Thinking of you) which was featured at Prelude 11 and will premiere during PS122’s 2013 Coil Festival, and Ghost Rings, a fully-sung-through performance for the actresses Kristen Sieh and Erin Markey. Satter attended Mac Wellman’s graduate playwriting program at Brooklyn College.